Hamas leader refuses 'to turn Gaza into an area for managing Israel's elections' after Cabinet approves transfer of funds. The Hamas deputy leader in Gaza announced that the organization's leadership met with a Qatari envoy in the Gaza Strip and informed him that they refused to accept the third round of Qatari money, Arab media reported. "We will not turn Gaza into an area for managing elections in Israel," senior Hamas officials told the Qatari envoy. The Hamas statement comes shortly after Israeli Prime Minister Binyamin Netanyahu and the Security Cabinet approved the transfer of the $15 million from Qatar to Hamas in Gaza. Israel had halted the money transfer on Tuesday following the shooting of an IDF soldier by a terrorist from Gaza. The soldier was lightly injured. 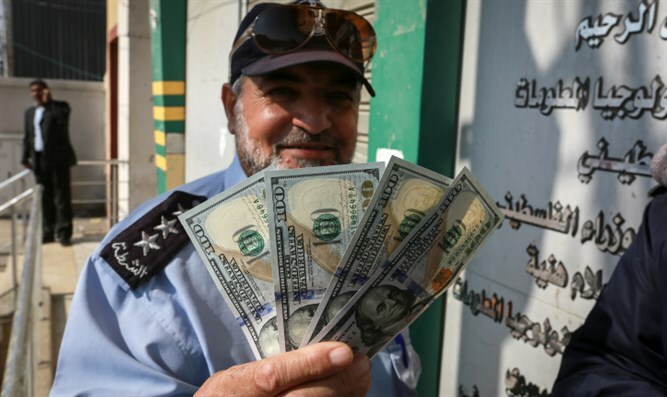 On Wednesday evening, it was reported that the defense establishment recommended that the $15 million be given to Hamas in order to calm tensions between the two sides. Senior security officials also said during the cabinet meeting that the Islamic Jihad terrorist organization was responsible for shooting the IDF officer and not Hamas.